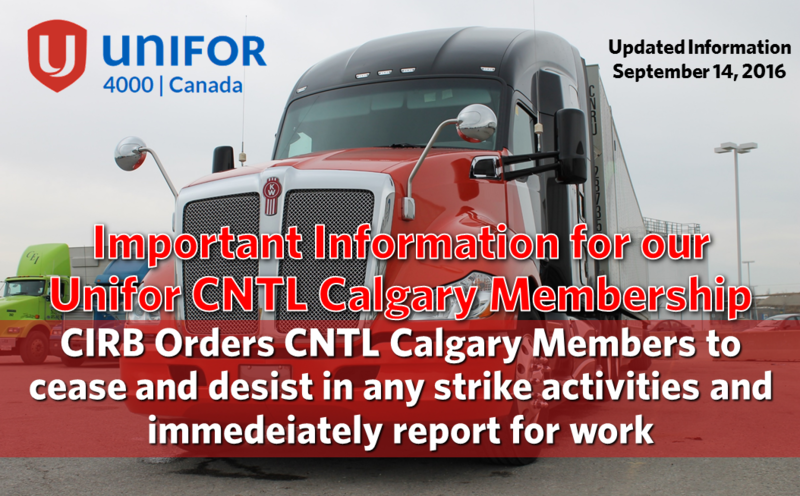 On the morning of September 12, Unifor National Council 4000 received a letter from CN with regards to rumours circulating at the CN Calgary and Vancouver Intermodal Terminals of certain CNTL Owner-Operators possibly violating Sections 88.1 and 89 of the Canada Labour Code and Article 4.1 of the CNTL-Unifor Collective Agreement. In addition to the article and membership communique we published below, the Union also followed up with those members who booked off on September 11 and 12 by emailing these members a copy of our September 12th communique, as well by telephone calls, informing them of the serious consequences that could result if any of them were engaging in a work stoppage or strike action as CNTL was alleging. CN contacted the Union again on the morning of September 13, advising that despite the members that booked off on September 11 and 12 were making themselves available for work again, more members were making themselves unavailable on September 13. Following CN's application to the CIRB (the Board), the Board conducted a hearing by teleconference at 16:00 MDT on September 13 between the Union, legal counsel and senior management of CN and officers of the Board - the Regional Director and Chairperson of the CIRB. Representing the Union on this call was Unifor Lawyer and Director of Unifor's Legal Department Anthony Dale, National Representative Bob Fitzgerald, and Council 4000 President Barry Kennedy. (iii) The trade union and the employer shall take immediate steps to communicate the Board's Order to the Owneroperators affected by the Order. THIS ORDER is made pursuant to the provisions of section 91 of the Code and shall remain in effect until the requirements of section 89(1) of the Code have been met, unless it is modified or revoked pursuant to an application under Section 93 of the Code. Pursuant with the above Order, the Union asks that any members who may still be showing as unavailable for work, please make immediate arrangements to make yourself available for service. Failing to do so, members will likely be deemed to be defying the Board’s Order and thus participating in strike action as defined in Section 3(1) of the Canada Labour Code. Such members will face serious consequences, including disciplinary sanctions up to and including the termination of the member's standard contract with CNTL. This morning (September 12), Unifor National Council 4000 received a letter from CN Human Resources and Labour Relations with regards to the rumours circulating throughout the CN Calgary and Vancouver Intermodal Terminals that certain CNTL Owner-Operators may be in breach of the Canada Labour Code and Article 4.1 of the CNTL-Unifor Collective Agreement due to a higher number of absences yesterday and today. To all Unifor Council 4000/Local 4001 CNTL members based in Calgary, please tap here to read and download an important letter. Please distribute this important communique and post it on Union bulletin boards at the workplace. This letter addresses the potential consequences for actions some members may have taken or may be contemplating taking in response to problems members have been having with CNTL Dispatch.